Glycolipids are a critical structural feature of the plasma membrane. In addition to biosynthetic pathways, glycolipids content is regulated by glycosyl hydrolases at the membrane. Our group has been investigating the role of the membrane-associated neuraminidase (NEU3). Using a recombinant form of the protein, we have modeled the active site of the protein, and are working to develop specific inhibitors (Albohy, 2010). Human neuraminidase enzymes are potential targets of anti-viral strategies that inhibit viral neuraminidase enzymes. Our group is examining the differences between the recognition of viral and human enzymes (Albohy, in press). Projects in the lab continue to examine inhibition, substrate specificity, and biological function of the human neuraminidase family (Zou, 2010). Related projects are testing the role of glycosylation in the function of integrin receptors. Chemists are uniquely qualified to develop new probes for biomolecular systems. We are applying new chemical methods to label specific receptors in live cells. Labeling strategies we are currently developing involve targeting membrane lipids (Sandbhor, 2009), glycoproteins (Loka, 2010a), surfaces (Loka, 2010b), and enzymes (Key, 2011). Membrane lipids are not only structural components of the bilayer, but also serve a role as signaling molecules. Using chemical synthesis, we are developing modified lipids which can be used to detect the location and chemical modification of sphingolipids and glycolipids (Sandbhor, 2009). Ongoing work is aimed at using these tools to probe membranes of live cells using fluorescence microscopy. Phosphorylation is a prevalent post-translational modification in human cells. Phosphorylation is carried out by kinases, and removed by phosphatase enzymes – forming a regulatory cycle. Our group is developing chemical strategies to inhibit and specifically label phosphatase enzymes. Current targets include the receptor-like tyrosine phosphatase, CD45 (Tulsi, 2010). Insight into biophysical mechanisms requires quantitative methods for observing biomolecules. We use observations of receptor motion (lateral mobility) in the plasma membrane as a tool to visualize biochemical events (Cairo, 2010). 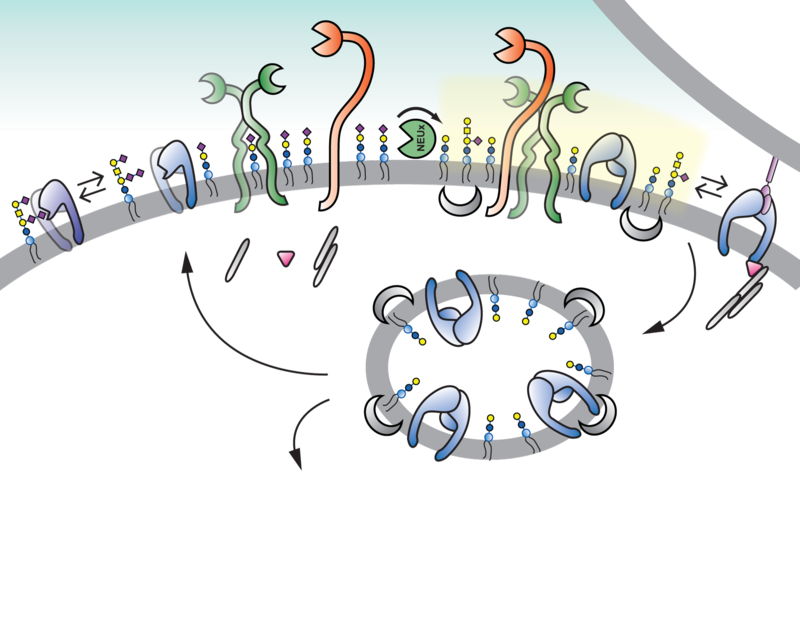 When appropriately labeled, the trajectories of single receptors can be observed and used to understand the types of interactions the receptor engages in. This methodology is highly dependent on effective labeling strategies – and can allow the visualization of nanoscale organization in the membrane. We have recently developed a new analytical method to identify the size of receptor clusters in the membrane using SPT (Rajani, 2011). “Dynamic regulation of CD45 lateral mobility by the spectrin-ankyrin cytoskeleton of T cells,” C.W. Cairo*, R. Das., A. Albohy, Q.J. Baca, D. Pradhan, J.S. Morrow, D. Coombs, and D.E. Golan, Journal of Biological Chemistry, 2010, 285(15), 11392-11401. [epub: Feb 17, 2010;DOI] Also see our highlight on EurekAlert! “Analysis of molecular diffusion by first-passage time variance identifies the size of confinement zones,” V. Rajani, G. Carrero, D.E. Golan, G. de Vries*, and C.W. Cairo*, Biophysical Journal, 2011, 100(6), 1463-1472.accepted Jan 28, 2011; epub Mar 17, 2011; DOI]. “Selectivity of a new class of oseltamivir analogs for viral neuraminidase over human neuraminidase enzymes,” A. Albohy, S. Mohan, R.B. Zheng, B.M. Pinto, and C.W. Cairo*, Bioorganic and Medicinal Chemistry, in press [accepted Mar 18, 2011].